Thanksgiving Tummy, I believe you know what I am talking about. The tummy that feels thick, full, and bloated right after the delicious Thanksgiving meal and sets up shop far beyond that. The kind of tummy ache that has you sitting and leaning back as much as possible to make more room for all the delightfully, delicious foods you just ate. Is there a way to experience our heartwarming together time at the dinner table on Thanksgiving Day without experiencing all this discomfort? AND not feel deprived? I believe that there is. This is a very common experience, one that my clients ask me for a solution to every year. Now, I can give you this vital and important piece of information to alleviate this discomfort that is brought on by over-consuming rich homemade foods but I want you to understand something first. This practice I am going to share with you in a moment isn’t easy to implement. Unfortunately, a life time of eating quickly and overstuffing has become a habit to most people. Well, the reason for this is when the tummy is over-filled, your digestive response becomes slower…that is the reason for the tummy ache….and it is not uncommon for it to last until the next day. Once the stomach is filled with too much food to process, the body system goes in to a mild state of stress, which pulls the blood AWAY from the gut. This is not the gut response we want…. we want as much of our blood to be congregated in the gut region so that our food is digested and assimilated completely and in a timely fashion. Another thing that occurs is cortisol is raging through the body, this sets up as adipose tissue (fat) in the mid-section. This is something else we do not want. This cortisol also bathes the brain and causes the brain to be in a stupor and you get sleepy. Next thing you know you are in the throes of a Thanksgiving nap and the body’s digestive system slows even more…Therefore most people wake up from the nap with a big tummy ache and indigestion. The stomach didn’t have a chance to push the food through the system in time, therefore it just sat in your stomach. No wonder the feeling of Thanksgiving is a mixture of anticipation for a delicious meal and trepidation. The Thanksgiving hang-over is nothing to smile about. Well, here it is. 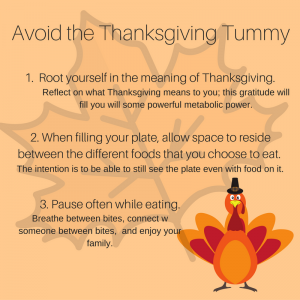 I want to share with you 3 things that I have put to the test that will help to eliminate the Thanksgiving Tummy. First and foremost, have your feet firmly planted in the knowledge and meaning of Thanksgiving. It is not about the food…well it is, but eating the food is not the most important aspect of Thanksgiving. The most important aspect is the Thankfulness for the bounty before us. I recommend slowing your morning just a bit, spend a few quiet minutes alone reflecting on what Thanksgiving means to you. This gratitude will fill you will some powerful metabolic power. Meaning…your physiology will become super charged and ready to burn fuel. Secondly, when filling your plate, allow space to reside between the different foods that you are choosing to eat. The intention is to be able to still see the plate even with food on it. Remember, you can always get more…you just don’t want more right now. Thirdly, pause often while eating. Put the fork down between each bite, chew thoroughly, swallow and THEN BREATHE. Do not take another bite until the one you just swallowed has been massaged with a couple of breaths. During this time, look around the table and make eye contact with your loved ones. Enjoy the connection with one another. Absorb every aspect of the meal with ALL your senses. This will engage CPDR. Engage ENS by eating Slow and with breath. These together will gift you with a fulfilling meal that leaves you energized AND NOT with the Thanksgiving Tummy. You see, CPDR and ENS are the head brain and gut brain connecting and communicating that you have gained both pleasure and satisfaction from your meal. Read my blog posting on this topic. AND when you listen to this communication, you will STOP eating BEFORE you reach full. You will be left with the ability to burn your meal completely and enjoy leftovers that evening or next day. You see, you can have more….it just isn’t when you thought it was would be. I encourage you to relax with your Thanksgiving, acknowledge and know that all is beautiful and right in your world. I am so very grateful for you; may many blessings be bestowed upon you and your family. Great article, thanks for the tips! I’m going to share on FB and Twitter! Thank you Jody! I am so glad it was helpful!! Wonderful words of wisdom! I will try to breathe and be thankful between bites. AND try and leave space on my plate. I love you! Thank you Julie. That’s it…breathing and gratitude! I’m glad this was helpful for you.